Eating San Jose has a great review of The Table's brunch menu, one of my favorite restaurants in Willow Glen. I have yet to go there for brunch, but based on the review it seems worthy of a special trip just for that purpose. The lemon ricotta pancakes and biscuit & gravy topped with fried chicken and an egg look delicious. 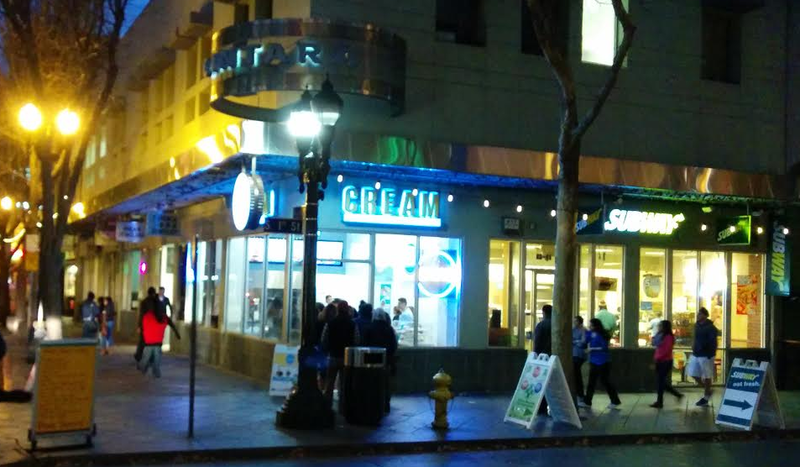 Check out Dale's full review at Eating San Jose over here! 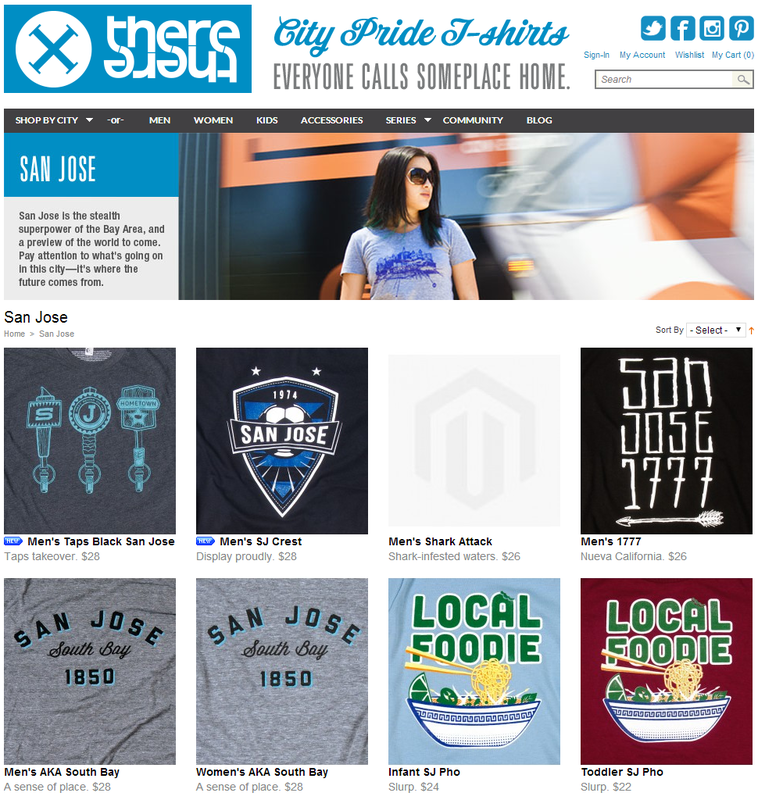 There are so many projects in the queue for North San Jose that it is difficult to keep track of them all. You have the mysterious Peery-Arrillaga project that would encompass one huge Fortune 100 tech tenant and up to 2 million SQFT. Then you have n1 Campus with up to 2.8 million SQFT. Over on Zanker Road you have Innovation Place with 540,000 SQFT. 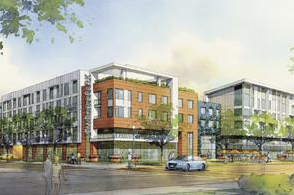 Now there is talk of another huge office project moving forward in the area. Boston Properties owns a 24.5-acre business park on North First Street with five buildings totaling 190,000 SQFT that were all built in 1981. They want to tear down all of these buildings and create up to 1.55 million SQFT of new office space along with some retail. Most buildings would be 5-6 stories tall with one up to 10 stories (perhaps taking a note from Samsung). It is still not clear if Boston Properties is going to wait for some anchor tenants to build or start the project speculatively, but they are applying for entitlements which could be approved by the city as soon as the end of the year. One thing is certain, North First could look dramatically different in a few years than it does today. 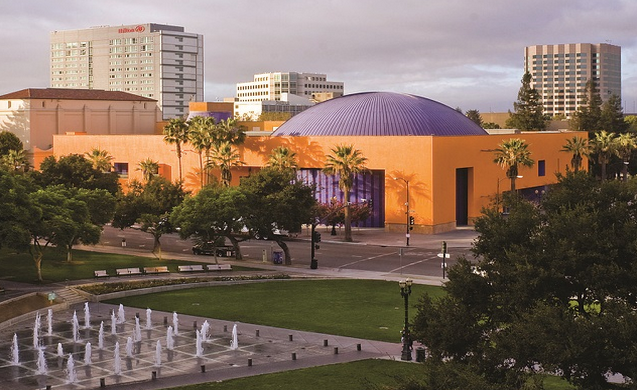 San Jose, CA – Join us for the first-ever tech walk, an only-in-Silicon Valley event that brings together two of San Jose’s favorite attractions, Santana Row and The Tech Museum of Innovation. Registration is in Santana Row Park, and will begin at 5:50 p.m.
“Your Life in Data” lets you experience the latest in wearable data gathering. Brainwaves, muscle tension, pulse, light levels, colors, faces, speech and voice levels will all be logged and displayed back to you. “Minimasher,” a multiplayer electronic instrument that allows you to jam out on three sets of drum pads triggering drum, bass, and synth sounds. “3D Printing -The Future of Making” demonstrates the wonder of 3D with various printed objects on hand. You can try freehand plastic creation with the 3Doodler. “Hacker vs. Hacker” challenges you to break into a safe and win a prize. Find the best way in: do you pick the lock, crack the code, or jump the right wires? “Scribble Scratch” is a modified consumer DJ controller that puts you in charge of the DJ rig, the iconic Hip Hop instrument. 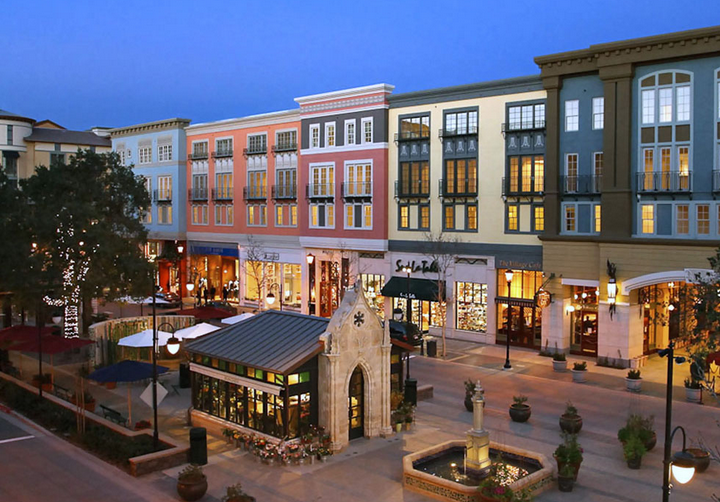 the ownership, management, development, and redevelopment of high quality retail assets. Federal Realty's portfolio (excluding joint venture properties) contains approximately 20 million square feet located primarily in strategically selected metropolitan markets in the Northeast, Mid-Atlantic, and California. 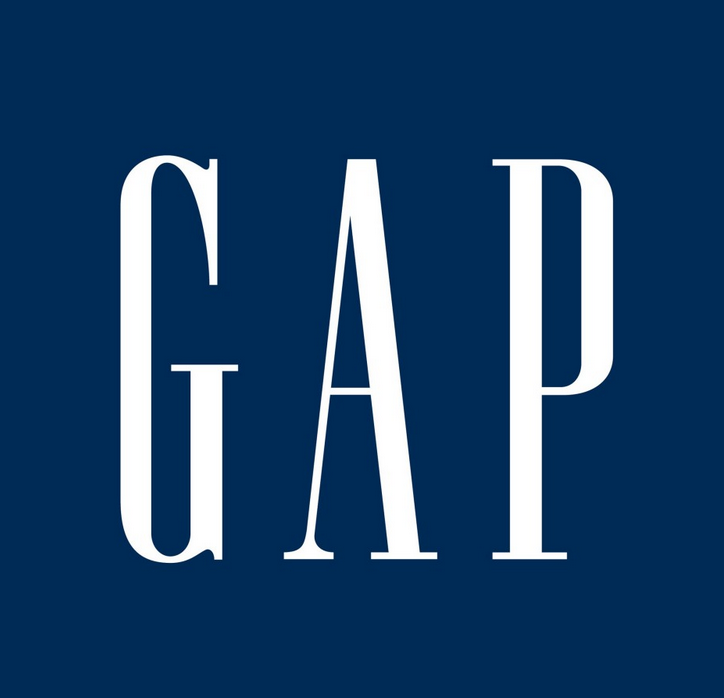 In addition, the Trust has an ownership interest in approximately 1.0 million square feet of retail space through a joint venture in which the Trust has a 30% interest. Our operating portfolio (excluding joint venture properties) was 95.3% leased to national, regional, and local retailers as of June 30, 2014, with no single tenant accounting for more than approximately 3.2% of annualized base rent. Federal Realty has paid quarterly dividends to its shareholders continuously since its founding in 1962, and has increased its dividend rate for 47 consecutive years, the longest record in the REIT industry. Federal Realty is an S&P MidCap 400 company and its shares are traded on the NYSE under the symbol FRT. This Sunday come sample local wines and craft brews along the Alameda while checking out 17 different businesses participating in the 4th Annual "Stroll the Alameda." 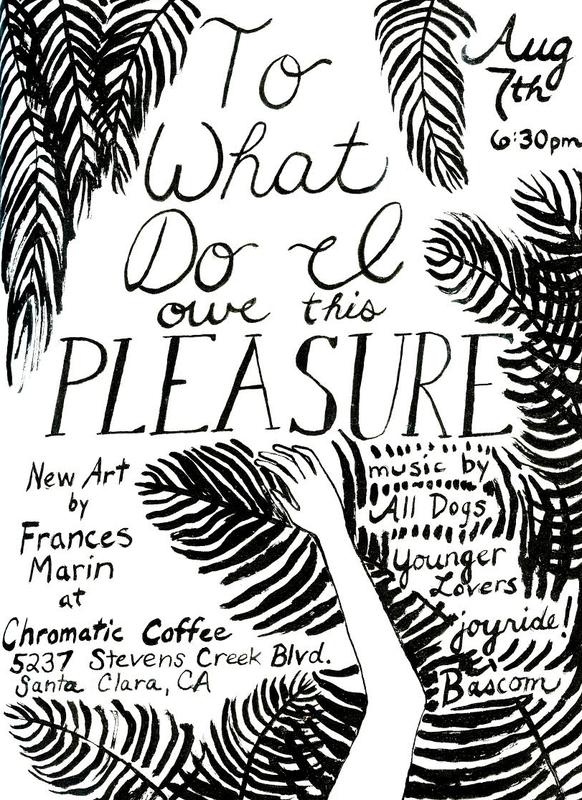 In addition to great drinks, you'll have music, painting, and other activities. Tickets are only $25 in advance and include a souvenir glass. As usual, the details are below. Hat-tip to our friend Alex Shoor for sending this in (and congrats on joining the Shasta / Hanchett Park Neighborhood Association board). 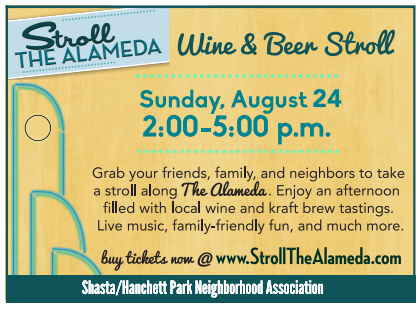 What: The Shasta/Hanchett Park Neighborhood Association (S/HPNA) and Alameda Business Association (ABA) will co-host the fourth annual Stroll The Alameda Wine & Beer Stroll. Local businesses along The Alameda are paired with a local winery or local kraft brewery. 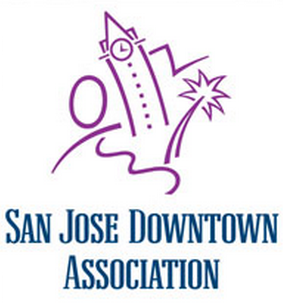 Participants in the Stroll will receive a souvenir glass and a map for participating business along a condensed stretch of The Alameda in San Jose between Hester and Atlas. Where: Browse 17 business locations along The Alameda while tasting some of the best beer and wine the local area has to offer. For a complete and updated listing of participating businesses, visit www.strollthealameda.com. Tickets: The Stroll the Alameda Wine & Beer Stroll tickets are $25 in advance or $35 on the day of the event. 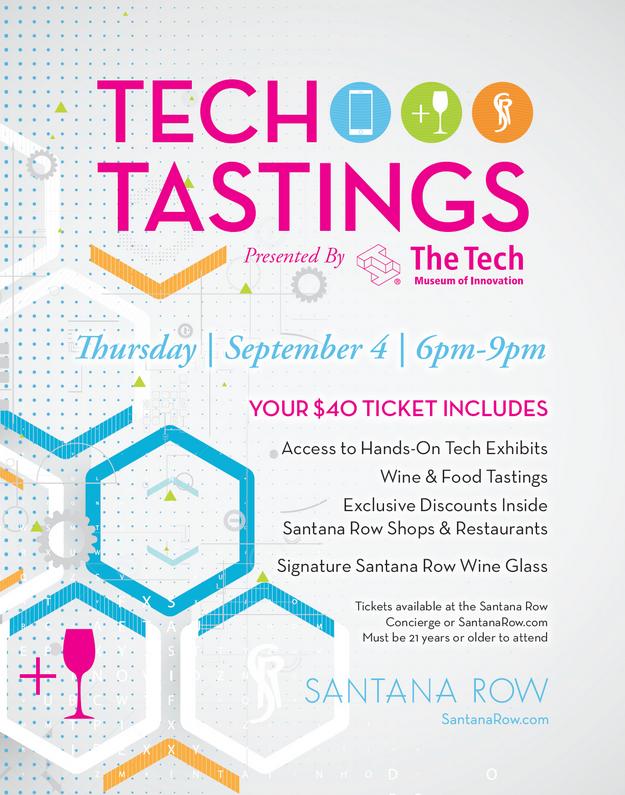 Tickets include a souvenir glass and wine and/or beer tastings. Advance tickets are available at www.strollthealameda.com. Day of event tickets can be purchased at the check-in booth in front of Westminster Presbyterian Church. Enjoy many activities for all ages during the event. The lawn at Westminster will serve as the central entertainment hub with a band playing on the steps, live painting, face painting, as well as many other activities. Bring the family, a blanket, and enjoy a lovely day along The Alameda. Additionally, several businesses will feature music at their location. Use #strollthealameda to share your event photos! Content Magazine Pick Up Party Today @ Paper Plane! 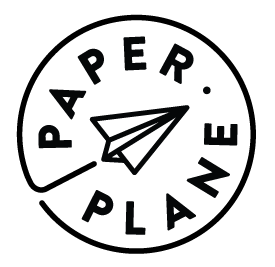 Content Magazine is having another one of their pick-up parties, and this time it is at one of my favorite new restaurant/bars Downtown--Paper Plane. If you are a subscriber, you get one free drink (and the drinks here are fantastic). Non-subscribers can stop by and purchase the latest copy for only $5 (half-price). Either way, this is well worth checking out! Come celebrate our new issue, 6.3 "Stage," with the Content Magazine community at one of San Jose's newest spots, Paper Plane. Subscribers, Contributors and People Featured will get one free drink and a copy of the latest issue. Non-subscribers can purchase the latest copy for $5 (50% off) at the Pick Up Party. 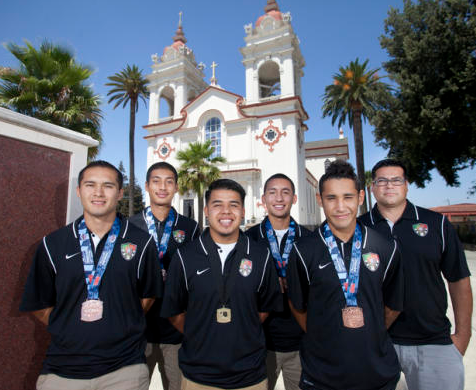 A soccer team backed by the Portuguese Athletic Club called "Los Tigres" has brought back a bronze medal in the US Youth Soccer National Championship Finals. Out of over 10,000 teams around the country, they came in third. Check out the full article over here. 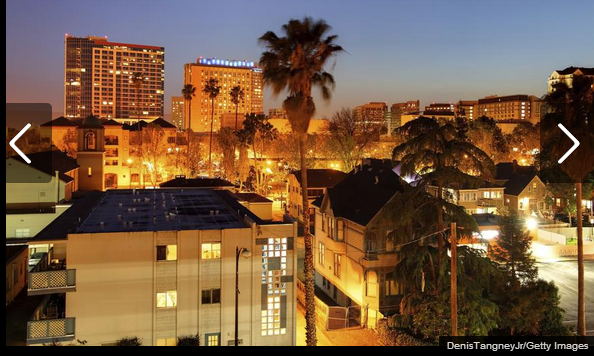 Saturday Stats: San Jose is One of "America's Coolest Cities"
San Jose ranked #16 on their list, tied with Los Angeles (I'll take it). SF ranked #5 and New York hit #11. Washington DC took the #1 spot. To see the full list click here. Being billed as Silicon Valley's first official technology conference, Techmanity is coming to Downtown San Jose on October 1st and 2nd. The event will be curated by Fast Company and has a nice list of speakers including CEOs, entrepreneurs, and VCs. Also, what's a tech conference without some fun? 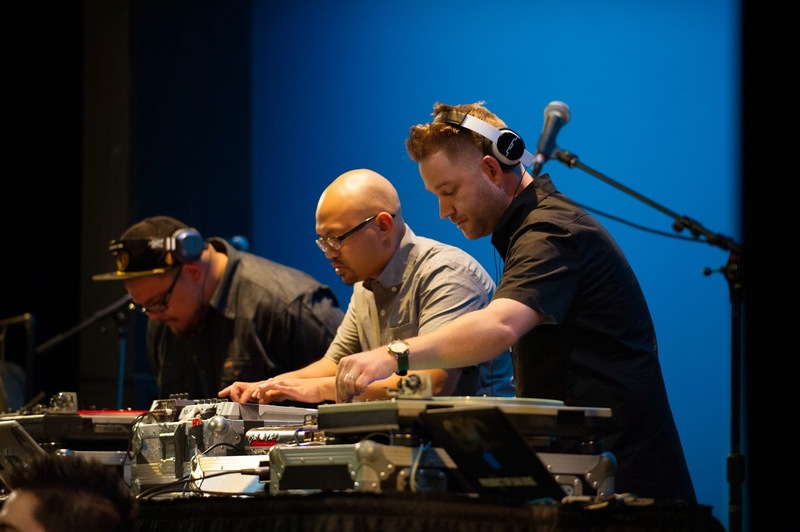 In addition to multiple networking opportunities Techmanity will also host several musical events with bands like Weezer, the Kongos, and Young Rising Sons. You can get all of the details in the press release below or visiting the Techmanity website over here. SAN JOSE, Calif.--(BUSINESS WIRE)--Techmanity 2014, Silicon Valley’s first official technology conference, today announced its lineup and open registration for its inaugural event, taking place in San Jose October 1-2. Headline speakers include Houzz founder and CEO, Adi Tatarko; Samsung Electronics president, Young Sohn; and a keynote by actor/musician turned tech entrepreneur, Jared Leto. The two day event, curated by Fast Company, will feature rapid-fire presentations from dozens of “radical entrepreneurs and vanguard geeks” representing the most disruptive and compelling ideas from Silicon Valley. After-hours entertainment and networking is being produced by Live Nation, and includes national music acts such as Grammy-award winner Weezer, who will be debuting its new album, Everything Will Be Alright in the End. Top-level sponsors include Samsung Electronics, Silicon Valley Bank and Adobe. 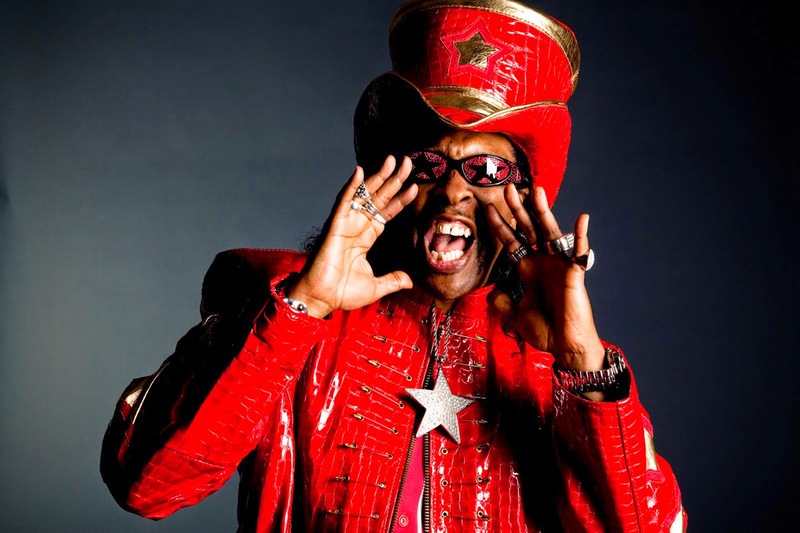 Designed as a next-generation conference experience and networking festival, Techmanity is a gathering of the Silicon Valley tribes celebrating the region’s future-bending companies, entrepreneurs, inventors and ideas. Techmanity will feature a riveting mix of the Valley’s movers and shakers – people who are cultivating new business models and disrupting the status quo – alongside passionate social entrepreneurs leveraging new innovations to improve the lives of those who might otherwise be left behind by technological progress. Topics on the agenda include the Internet of Us, the future of post-job work, building a cult brand in a media-saturated world and the power of second chances, among many others. In addition to these conference sessions, Techmanity will also celebrate the winners of its Techmanitarian Awards, and showcase the hottest, most disruptive startups in its Startlandia exhibit. In the evening, attendees will have the opportunity to enjoy networking events featuring performances by Weezer, Thievery Corporation,Kongos, Crown and the Mob, Young Rising Sons and more acts to be announced. To register for Techmanity 2014, please visit www.techmanity.com/registration. Media registration can be found here:www.techmanity.com/media. Techmanity is Silicon Valley’s first annual technology and lifestyle event celebrating the companies and people whose products and services are revolutionizing our world. For two days in October 2014, Techmanity will command center stage on the tech world with mind-blowing conversations with the brightest people in the industry, dozens of exciting networking events hosted by leading Silicon Valley companies and an incredible line-up of special programs showcasing the best new apps, business models and startup ideas on the planet. Valley Verde is a small non-profit in San Jose that wants to improve access to homegrown organic vegetables while assisting low-income families. They started an Indiegogo project that will be used to fund supplies such as greenhouses that would be placed at the homes of "Super Jardineros." Valley Verde will train these gardeners on how to grow varieties of ethnic seedlings (finger eggplant, tomatillos, chayote, etc.). They will then sell these seedlings either back to Valley Verde or to local farmer's markets. The end result should be easier (and theoretically less expensive) access to locally grown organic vegetables, all the while helping low income families with both a sustainable income stream and entrepreneurial skills. Valley Verde is aiming to raise $10,000 which will be enough to provide 10 families with green houses, seeds, seedlings, trays, pots, domes, heating mats, and training. It's a great cause and you can learn more by watching the video below and visiting the Super Jardineros Greenhouse Project page. 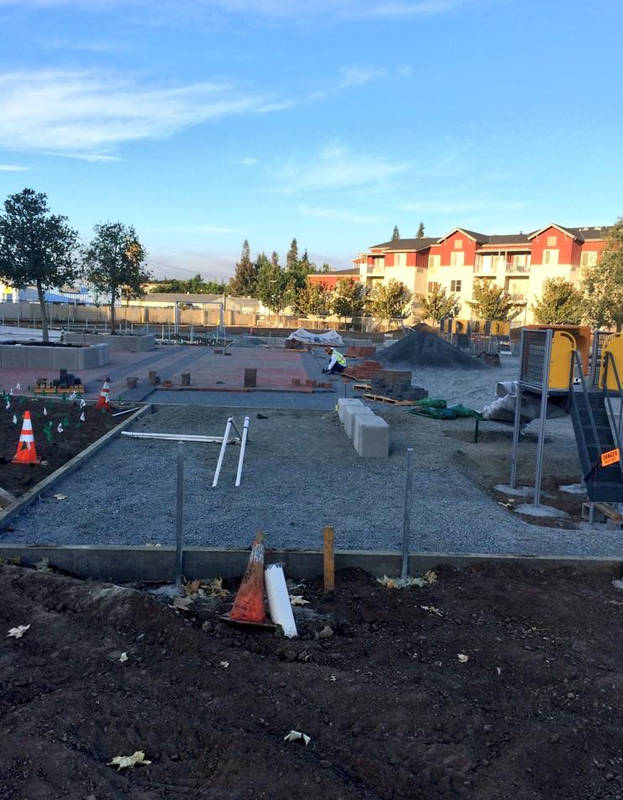 Balermino Park is being built on 1.8 acres near the Almaden Family Apartments. 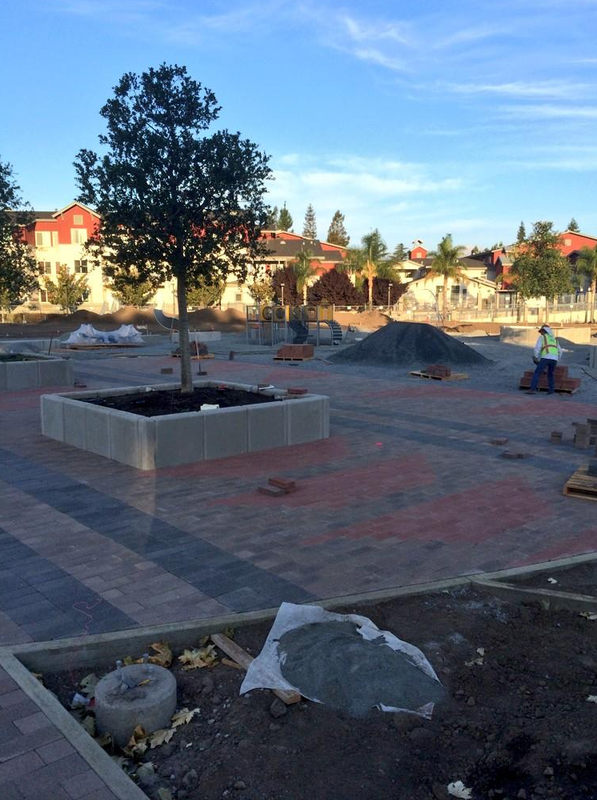 The most unique feature in the park will be a pavement design that resembles traditional Ohlone basket weaving (the person the park is named after was born to Ohlone-speaking parents). 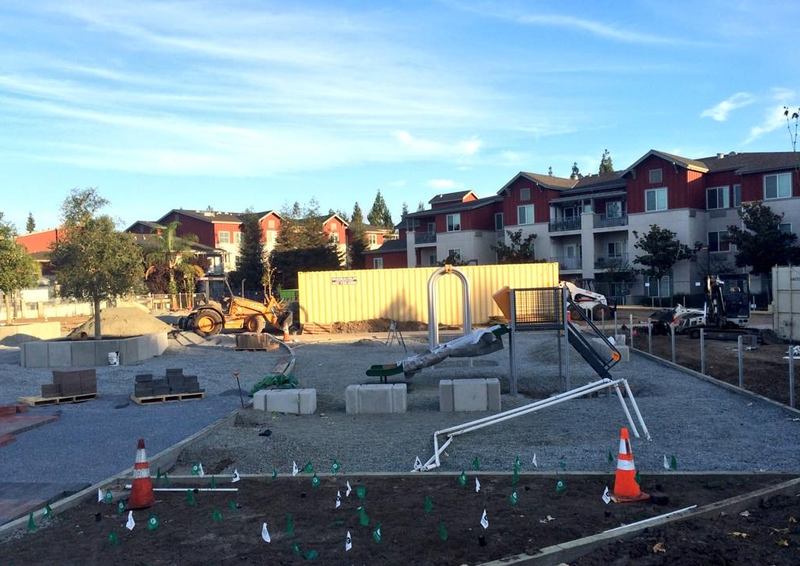 Balermino will also have picnic areas, play structures, and a basketball court. 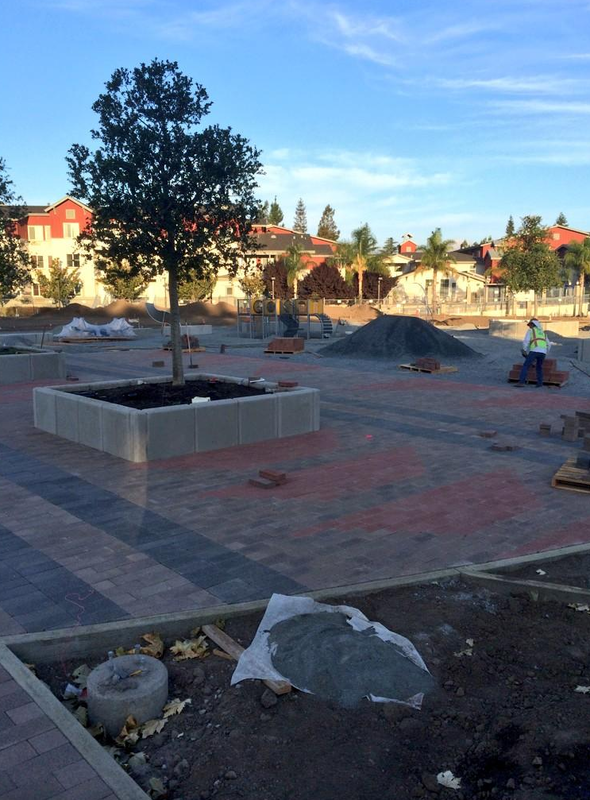 Completion is scheduled by the end of the year and based on the photos below from San Jose Trails it looks like a lot of progress has already been made. After eight years of stalls and delays, the Century Center Towers project is getting a new push. Barry Swenson Builder is now partnering with Essex Property Trust to get two 12-story residential towers built at 1733 N. 1st St. 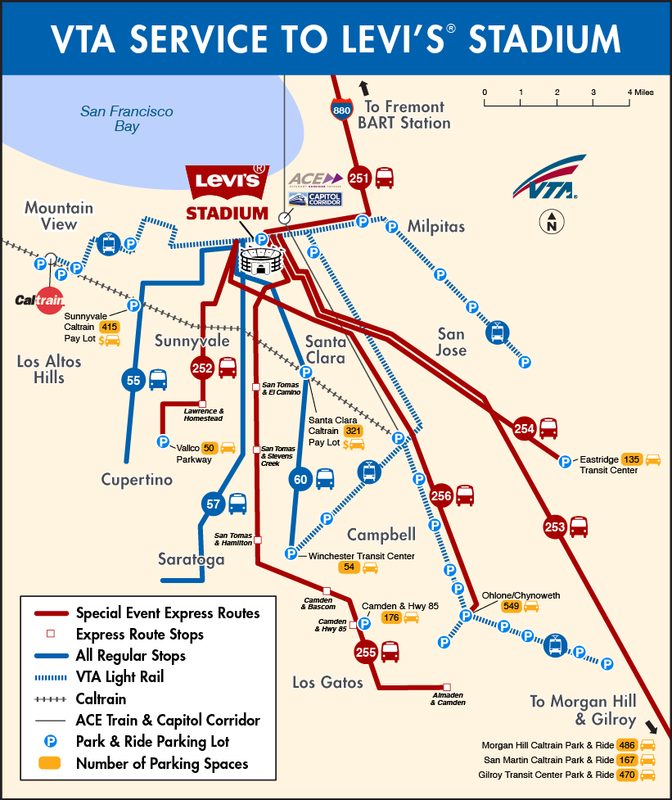 The location is near the old Sony campus and Casino M8trix, and has convenient access to both light rail and Highway 101. 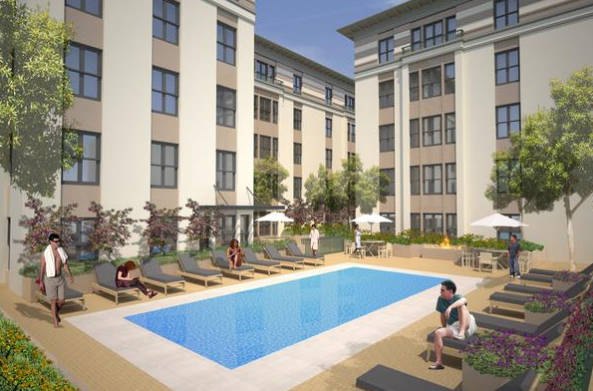 Century Center Towers will have 376 apartment units and will cost $170 million to build (including land costs). There were no special incentives or fee reductions here, and the land is already being prepped for construction. 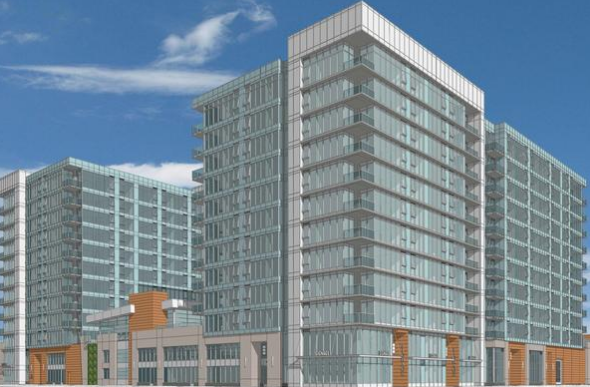 This is the first San Jose residential high-rise building to be built outside of Downtown San Jose. I don't think it will be the last. 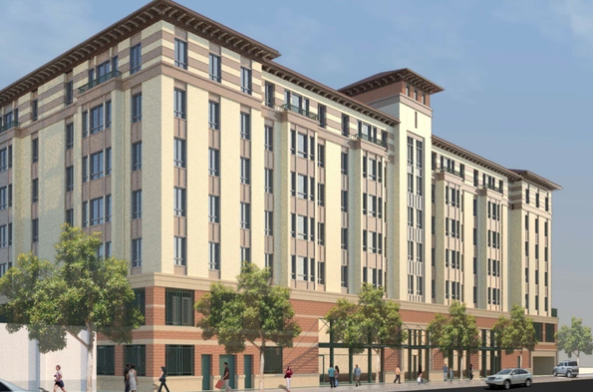 This is a strong sign of increasing density in San Jose, and a new push to build in transit corridors. Hopefully more corporations (like Samsung) will employ this model as well as opposed to your traditional sprawled out office campuses. 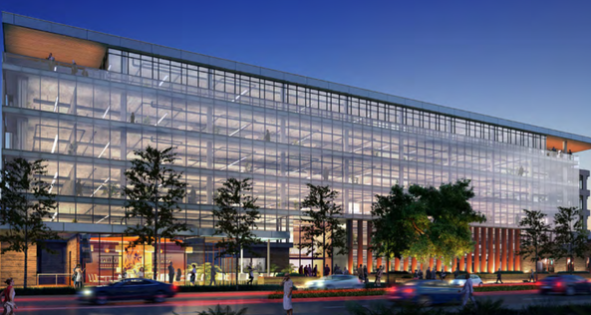 A 225,000 SQFT, six-story office building a the end of Santana Row is going to break ground this year--with or without a tenant. This is known as building on spec (speculation). Usually developers don't do this unless the market is extremely strong. The building will be unique for San Jose. It is being modeled similar to a loft building in SF's SoMa district than your typical office building here. 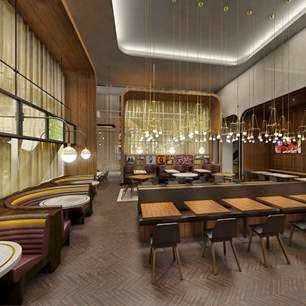 The ceilings will be huge with giant floor plates, ideal for modern companies focused more on collaboration rather than a cube culture. 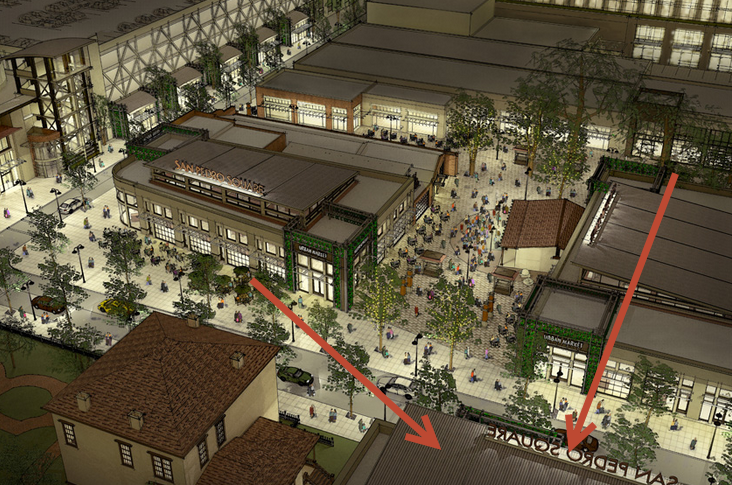 Also part of the plan will be 1,500 SQFT of retail on the ground floor (why not more?) 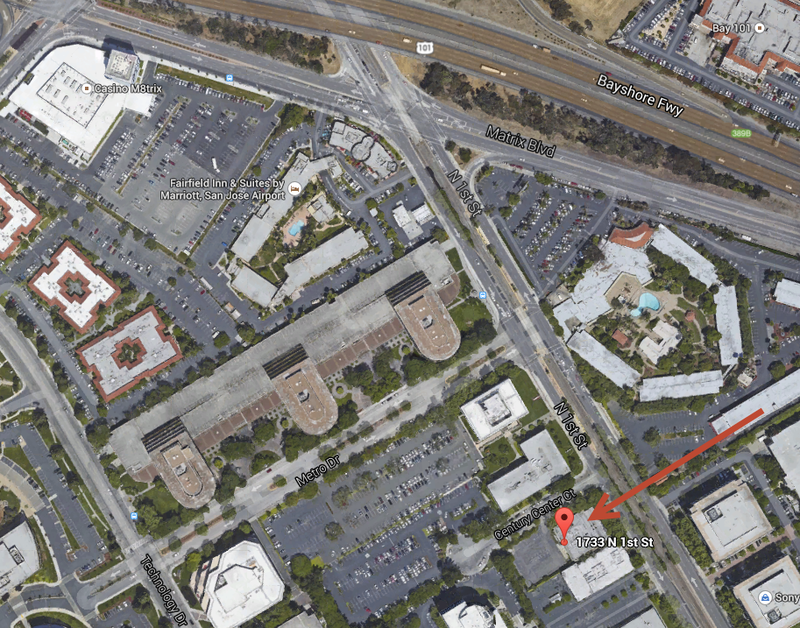 and 670 underground parking spots that will be usable for Santana Row visitors during nights and weekends. What city is that below? Check out the following short video to see two of San Jose's previous city halls... one that looks like a castle and the magnificent structure below. This might be my favorite Sourisseau News video so far. A Tale of Two City Halls - San Jose from WMS media Inc. on Vimeo. 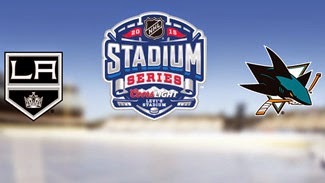 Despite last Monday's not-so-surreptitious leak of a proposed Stadium Series outdoor game between our Sharks and the Los Angeles Kings by Ticketmaster, it was officially announced today, via NHL.com, that the Stadium Series will indeed be returning to California next season, and held at the newly constructed Levi's Stadium in Santa Clara. As arguably two of the biggest "modern day" rivals in the NHL, a thrilling Sharks/Kings series is also a testament to the upward trend of the popularity of ice hockey in California, which led to the decision to bring the anticipated outdoor regular season game back to the Golden State for the second year in a row. Sharks fans are going to have their raw emotions all over this one, especially after dropping a disappointing playoff series last season to the eventual Stanley Cup champion Kings team, when the Sharks had been in a dominant 3-0 game advantage position. Although the NHL's Winter Classic and Stadium Series outdoor games count just as one regular season game, the thrill of a rare and exciting event like this one can make the experience feel like something much more significant, and as such, this is why we must beat the Kings here at home. 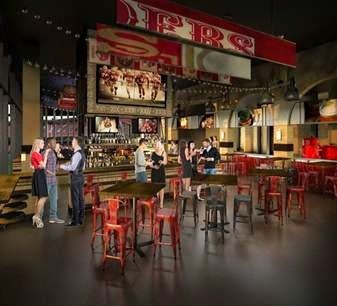 Levi's Stadium, the new home for the San Francisco 49ers, has the capacity of hosting more than 68,000 fans, and given the successful popularity of the NHL's outdoor games, this is likely going to be one of the largest sporting events Northern California will see for quite some time. Tickets go on sale tomorrow, Thursday, exclusive to season ticket holders for both the Sharks and the Kings, after which tickets will be available to the general public. Base prices range from a low of $65 to a high of $350. In the tradition of outdoor games, expect both teams to release customized jerseys for the event later this year. 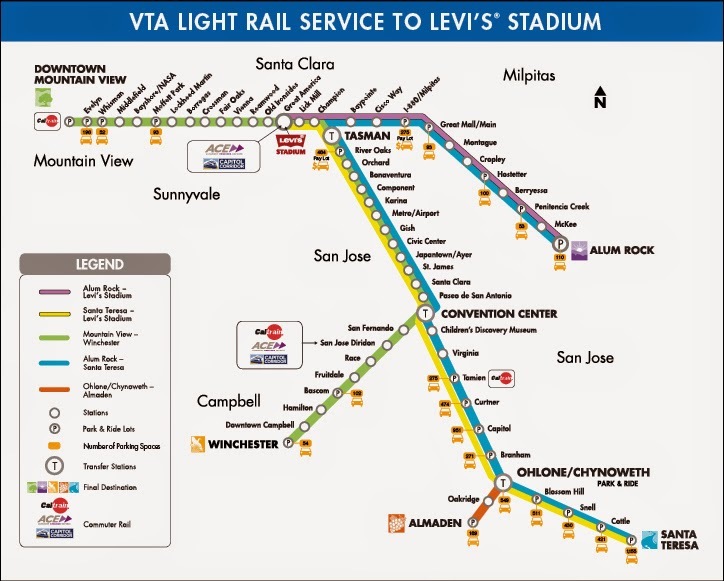 SPUR has an in depth analysis of San Jose's first BART Station and provides multiple suggestions for maximizing the land use around it. Its a bit lengthy, but is definitely worth a read if you are interested in future development or urban planning. 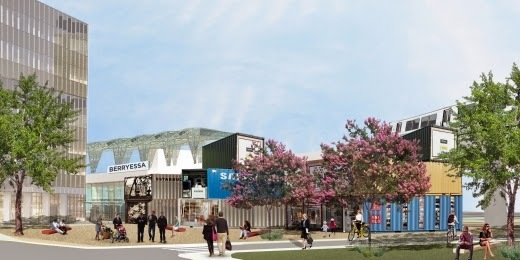 I really like the idea to create a retail park out of shipping containers right next to the station. Check out the article over here. Thanks to David Speakman for sending this in. 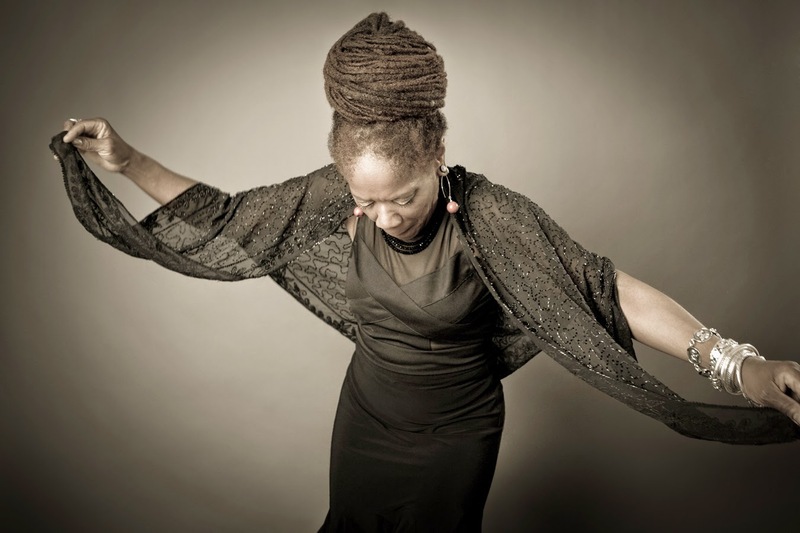 One of the largest Jazz festivals in the US is happening in Downtown San Jose this weekend. 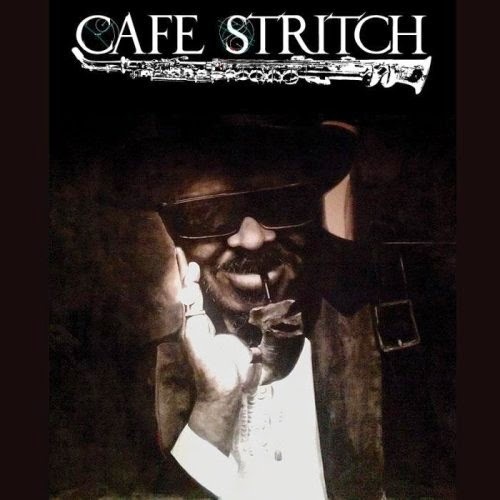 You will have world-class traditional jazz, Latin jazz, salsa, R&B, funk, smooth jazz, fusion, world music, and I'm sure a few surprises. 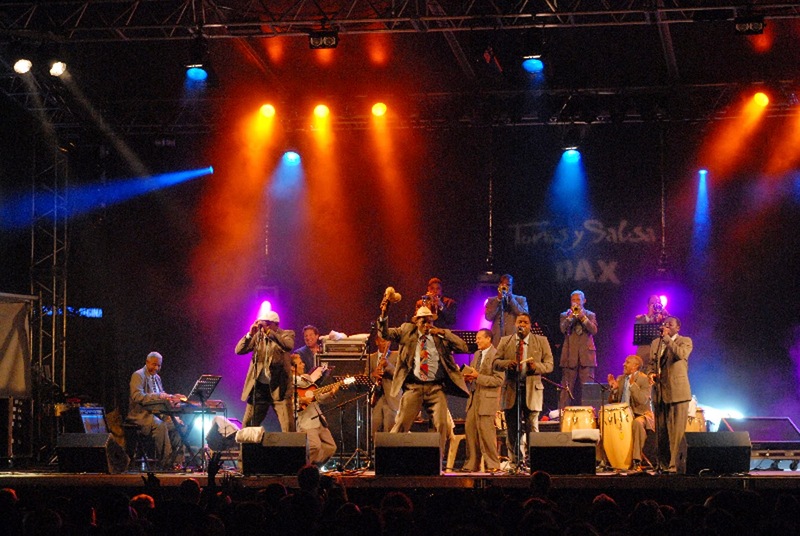 The featured artists this year are 2014 Grammy winners Pacific Mambo Orchestra, Bootsy Collins, Snarky Puppy, The Poncho Sanchez Band, Ledisi, David Sanborn, Joey DeFrancesco, Warren Wolf & Byron Landham, Kris Bowers, Monty Alexander and the Harlem-Kingston Express and many more. 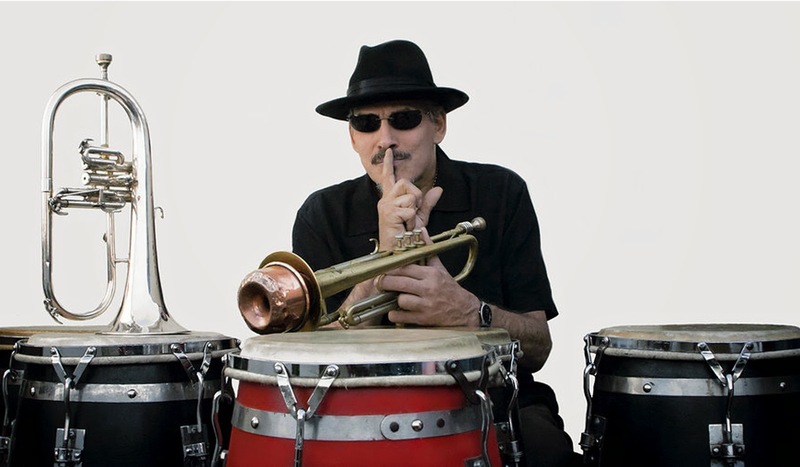 This year's San Jose Jazz Summer Fest will have music on 12 (!!!) different stages. Between the main festival and the side-events, you will be able to listen to live Jazz 24x7 throughout the course of the 3-day event. For more information, check out the links and the video below (which includes tons of great shots from across Downtown). This is an event you won't want to miss! A civic pride apparel company called therethere is aiming to build "pride of place" via unique graphical t-shirts created by local artists. 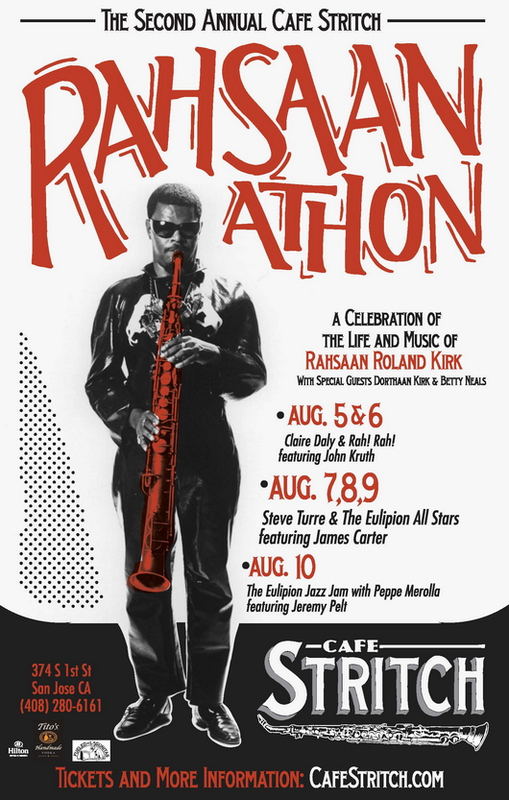 They are partnering with San Jose Public Library Foundation for the entire month of August. 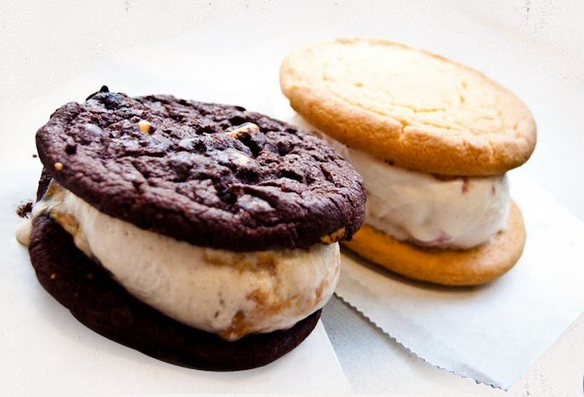 Specifically, 10% of their proceeds for the month will go towards the foundation! To check out their site and support our library system, click here. P.S. : You have to love the Pho shirt below... we have the best Vietnamese food in the US!